I grew up in the shadow of the Cascade Mountains. 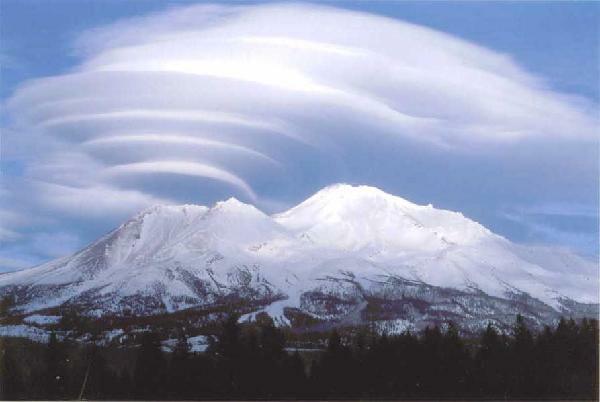 From the age of 3 to 9 I lived at the foot of one of the great mountains in America, the majestic Mount Shasta, a 14,160 foot double coned volcano that exudes mystery. I never climbed Mount Shasta, but I have climbed a few other shorter Cascade peaks, and so I understand the draw that mountains can have on people. There is something powerful and awe-inspiring about standing at the top of the mountain and looking out across the landscape. You see the handiwork of God very differently from high up in the mountains, standing above tree-line, where nothing is able to take hold except a few of the hardiest plants. The air is thin, cold, and clear. You feel as if you can touch the sky and even reach through the thin membrane separating heaven and earth and touch the things of God. From my own experience living among the mountains I can understand why people from time immemorial have gone to the mountains to encounter God. In the biblical story, we see people going to the mountain, from Moses to Elijah to Jesus, and there upon the mountains God is encountered, and lives are changed. In this week’s lectionary texts we go to the mountains to meet God. With Moses we go into the presence of God on Mt. Sinai, and with Jesus we go to the mountain where he is transfigured before our eyes and God speaks to him from the cloud of presence. We begin with Moses who receives a call from God to go to the mountain and receive the tablets of the law, which God has written for their instruction. And so he takes Joshua, and after leaving Aaron and Hur in charge, heads for the mountain. As Moses climbs the mountain, a cloud begins to envelope it, so that the “Glory of the Lord settled upon Mount Sinai.” They wait, presumably on the edge of the cloud for six days. On the seventh day, with the Glory of the Lord sitting on the mountain having the appearance of a devouring fire, God invites Moses to enter the cloud. As I read this description I have in mind the forest fires I remember seeing coming down the side of Mount Shasta as a child. They were far enough away that I didn’t have to worry, but the flames were large enough to get your attention. You can imagine the feeling of the people down below. Moses and Joshua have gone up the mountain, which is now engulfed in flame. Will they ever return? What will happen to us? Yes, I can only imagine. But then, Moses went up into the cloud and ascended the mountain, and there he spent forty days and forty nights. With this the passage ends – though if you continue reading you discover that it is in this forty day period that God reveals to Moses God’s desires for the people of Israel. All the directions for the creation of the Tabernacle and ordination of priests and more are revealed, as Moses is with God on the mountain. Most assuredly Moses is transformed by this encounter with God, though we later learn that when Moses emerges from the cloud his face shines so much that he must keep himself veiled. Paul suggests that over time the glow faded, but Moses kept the veil so as to cover up the loss of this sign of God’s presence. 2 Peter is one of those interesting texts. It claims to be written by one of Jesus’ closest friends and colleagues, though most scholars believe that it comes from a much later time, perhaps into the 2nd century. In this letter Peter writes that he was an eyewitness of God’s majesty and that of Jesus. We were there, he says, when God spoke: “This is my son, my beloved, with whom I am well pleased.” Yes, we were with him on the mountain. So, listen to our testimony. Listen to our interpretation – for “no scripture is a matter of one’s own interpretation.” Prophecies come not by human will, but by people moved by the Holy Spirit to speak for God. I think that the author of this letter is pulling something of a power play – I was there when God spoke to Jesus, therefore, listen to my interpretation of Scripture, for Scriptures aren’t the matter of one’s own interpretation. Still, despite this almost unseemly display, we hear in it a word of witness to the encounters the people of God have on the mountain, encounters that can be life changing. Finally we come to Matthew’s account of the Transfiguration. Note that Jesus goes up the mountain after six days – is this reflective of Moses’ ascent to Mount Sinai? Of course, we need to go back a chapter to see that according to Matthew, it was six days earlier that Peter made the Good Confession, declaring that Jesus is the Christ/Messiah and Son of God (Mt. 16:16). Even as Moses took Joshua with him, Jesus took three of his closest associates – Peter, James, and John – with him up the mountain. There he was “transfigured” or transformed before their eyes so that his face shown like the sun and his clothes became a dazzling white. There is similarity to Moses’ encounter, but here, the transformation seems to be less a reflection of the encounter, but it emerges from within. It is, one could say, an unveiling of the glory of the Lord that is already present in Jesus. Then and only then do Moses and Elijah, representing the Law and the Prophets, appear and are seen talking with Jesus. It has been suggested that Moses and Elijah are seen here as transcendent beings, people who are caught up into heaven without dying. Peter sees all this and being something of an impulsive sort (the reason we like him so much) decides he has to do something. So, he offers to set up tents for the three conversation partners – or perhaps these are designed to be shrines. He recognizes that something powerful is happening and that Jesus must be someone of transcendent importance if he is standing in the presence of Moses and Elijah. It is at this moment that a cloud overshadows them – as on the Mountain of Sinai – and from the cloud comes a voice that states: “This is my Son, the Beloved; with him I am well pleased; listen to him!” Words that we the reader have encountered earlier in Matthew at the baptism of Jesus, but now they are repeated to fuller effect. At this the three disciples fall on their faces in fear. Jesus sees them, touches them (I find this to be a most poignant statement) and picks them up and tells them not to be afraid. Jesus does that a lot – telling his followers not to fear. It is at this point that they discover that Jesus is alone. Having had this encounter they head back down the mountain – not with stone tablets, but with a new sense of wonder and awe at the person they are called to accompany. For his part, Jesus tells them not to tell anyone about what happened on the mountain until after the Son of Man had been raised from the dead. As we reflect on these three texts that depict powerful encounters with God, encounters that are transformative, it is appropriate for us to ask of ourselves – in what way are we transformed by our encounters with the transcendent God? What are our mountain top experiences? From the looks of the rest of Matthew’s narrative, the disciples still don’t understand, even after their mountain top experiences. Are we any different? Does the wonder begin to wear off once we're back into the thick of things? Do we forget with whom we walk? May we be thankful for God’s patience! I would have stopped you, I heard that one already.